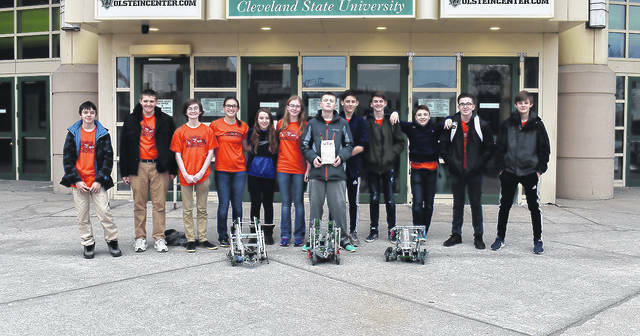 GALION — Fourteen Galion Middle School students earned the Teamwork Award at a robotics competition at Cleveland State University on Feb. 17. The students were divided into three teams. Team names and members included: Robros (Tanner Keinath, Walker Frankhouse, Kolton Tyrrell, Sam Albert, Max Longwell), Got a Screw Loose (Matt Gimble, Devin Johnson, Gregory Johnson, Grayden Pierce) and Galtech (Kaya Capretta, Hayden Kaple, Jaxon Oehler, Madison McCane, Ella Payne). Ella and her Galtech teammates built a double scissor lift claw-bot. Its main purpose is to pick up cones with its claw and stack those cones on the goals. Walker Frankhouse, an eighth-grade student at GMS, and his teammates designed an omni-wheel hybrid-H drive system with a six-bar attached to the drive system with a claw. The goal of the team’s robot was to pick up and stack cones. Frankhouse and his teammates started working on their robot in July. The competition as a middle school rookie team helped Walker learn how to prepare for future competitions. The Robotics Club, which is under the advisement of Isaac Keinath, meets after school on specified days. Students also utilize other times throughout the school day to work on their robots.